Dance marathon is now only two days away and we can not contain our excitement! 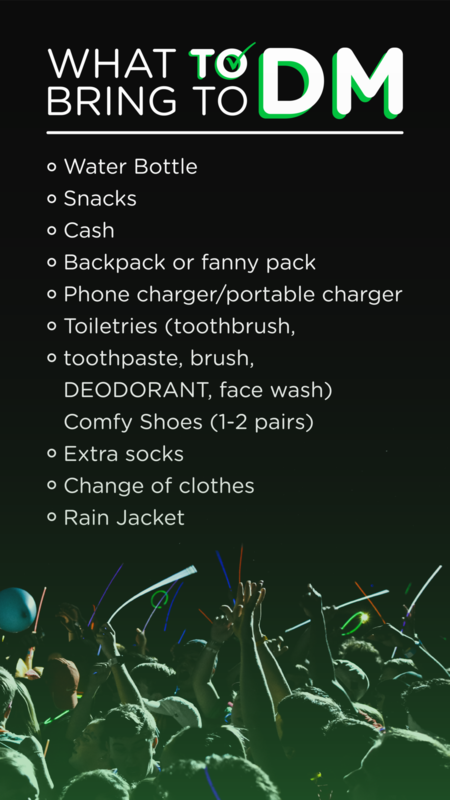 When packing for 24-hours in Tate grand hall, keep in mind these Dance Marathon necessities:. A Second Pair of Shoes - this is especially important if you are planning on taking the 24 hour standing challenge! Just one pair will not get you through this 24 hours, so be sure to bring your two (or even three) comfortable sneakers so you can switch off. Phone charger / portable charger- We advise you to soak up the amazing experience of Dance Marathon by not being invested in your phone taking too many videos and photos, but you will not want it to die! Phones do not last 24 hours, so bring a charger, portable charger, and maybe even a backup portable charger. You will want to document the incredible 24-hour experience. Water bottle- Hydration is key! Dancing for 24 hours can be exhausting, and you do not want to become fatigued, so bring a portable water bottle and make sure you are drinking from it! Cash/Credit Card/Venmo Account - You will be able to purchase food, drinks, merchandise and more at the event! Bring some method of payment whether its cash, a credit card or just the login to your venmo account. Toiletries- toothpaste, toothbrush, DEODORANT, facewash, lotion, dry shampoo, makeup wipes, chapstick, etc. This is a necessity! Dancing for 24 hours with 2,000 of your closest friends without a shower can lead to some funky smelling people, so deodorant is a must. When you start to get tired or start to feel gross, washing your face and brushing your teeth can make you feel like a new person. Change of clothes- Tank tops, shorts, t-shirts, jackets, all of the above! You will not want to be in the same clothes for 24 hours+ so prepare accordingly. Color group accessories- Go all out for your color group! Bring colored beads, body paint and other fun accessories to represent your color group! SOCKS- The absolute MVPs of Dance Marathon. Bring way more socks then you think you’re going to need, it’s almost guaranteed you’re going to use all of them. Fanny Pack- The tacky tourist worst accessory is your best asset for Dance Marathon. It’s the perfect place for your phone, snacks, charger, and everything else you may need for the event. Snacks- There will be six meals and opportunities to buy food/drinks at the fundraising station but it's important to bring extra to keep your strength up! A long night’s sleep- bring this with you in the morning!! You need at least 8 hours of sleep Friday night going into this marathon. We want 2,000+ bright eyed and bushy tailed people ready to embark on the best 24 hours they will ever experience so get some sleep Friday night and get excited for DM! Start packing and start getting excited! Dance Marathon will be the time of your life, so make sure you pack appropriately. Only two more days, get excited! There are exactly 5-days until Dance Marathon 2019!! For those who have never been to dance marathon, first disclaimer: you do not have to dance for 24-hours straight!! Dance Marathon is an incredible 24-hour event jam packed with family stories, color group wars, a morale dance, live music, silent disco, 5-a.m. rave, hair chop challenge, six free meals, laser tag and many more surprises! 24-hours may seem like a long time, but with so much going on all at the same time, you will never be bored! Dance Marathon officially begins Saturday at 10 a.m.Check-in begins at 8:30 a.m. and will run until 9:45 a.m. Check-in times will be divided up by color groups. If you’d like to get your beauty sleep Saturday morning (highly suggest!) then there is early check-in from 12 p.m. to 5 p.m. on Friday afternoon. After you get all checked-in, you will begin filing into Tate Grand Hall for the start of Dance Marathon and Opening Ceremonies!! One of our favorite DM traditions is the standing challenge, a challenge in which DM participants will stand for the entirety of Dance Marathon’s 24-hours in honor of the kids who can’t. The miracle families are always so grateful when they see your standing challenge bib and it means so much to them to see an organization of college students dedicating themselves to the health and lives of children they will never meet. Your feet might hate you the next day, but the impact you will make will make it all worth it. Another fun aspect of Dance Marathon are the color groups! Each color group is led by two color group captains, and throughout the day there will be color group wars in which the color groups compete against each other. Go all out for your color group and dress up in your color, it makes the color group wars way more fun! One of the most impactful parts of Dance Marathon is when we get to hear from our miracle families about their experience at Children’s Healthcare of Atlanta and with UGA Miracle. The families’ resilience and strength in the face of adversity will truly move you. The best part about their testimonies is that we get to see our “why” and who we have actually been fundraising for this whole year. Dance Marathon is a truly transformative experience. You will get tired, your legs will hurt but you will never feel more alive. The passion and dedication that radiates off of Tate Student Center will ignite your soul and the other 2,000+ students will push you and motivate you to keep going through the 24-hours. At the end of Dance Marathon, we will reveal our fundraising total for the entire 2018-2019 year. This moment is special and the cheers will be something you cherish forever. Dance Marathon only comes one day a year, so give it your all and make the most of these 24-hours. They will fly by much faster than you anticipate as you are running all over Tate Grand Hall with 2,000+ of your new friends. So get some sleep this week, drink lots of water, and get ready for 24-hours that you will never forget. The pool under construction at Children’s Healthcare of Atlanta. This year, UGA Miracle has the absolute honor to fundraise for Children’s Healthcare of Atlanta’s new aquatic therapy pool. This pool will make Children’s the only pediatric hospital in the entire southeast! The pool is not possible without UGA Miracle. Our $1.3 million goal will go directly towards finishing the pool’s construction and get it up and running for the hundreds of kids who will visit the pool every month. Any child being treated in Children’s extensive rehabilitation unit will be able to use the pool at their therapists’ behest. Aquatic therapy is especially beneficial to children who are being treated for traumatic injuries, musculoskeletal or neurological disabilities, or recovering from surgery. This zero-entry pool is wheelchair friendly and the floor can be slowly lowered without any awkward movements or pain and also features underwater cameras and a fun environment that prioritizes recovery while still allowing kids to have fun. Aquatic therapy benefits include: posture improvement, reduced pain that therapy on the ground may inflict, increased flexibility, better range of motion of the body, improved balance and coordination, and much more. All of these benefits that were previously out of reach for patients on land are now possible because of the pool! Most children being treated at Children's spend extended periods of time in the hospital during and after their treatment. Even though Children’s provides an incredibly supportive and lively environment, at the end of the day, the children are still in a hospital being treated every single day. The pool provides kids with a new and exciting opportunity for treatment, and an escape from their rooms or every-day land therapy. Water is a more exciting and fun place to learn, and it naturally motivates the children to participate in therapy without it feeling like a chore. While being treated in the pool, children become more mobile and aware of their bodies, movements, and breathing. Difficult tasks that the children are not able to accomplish on land are now possible in the water, creating an amazing sense of accomplishment for patients who can excel through water therapy. This pool is an incredible step towards creating healthier and happier kids at Children’s. It takes us to build the pool, and it takes us to create miracles at Children’s. In these next 24 days until Dance Marathon, we have to give everything we have in order to reach $1.3 million and help Children’s build the pool and provide an incredibly unique and beneficial experience to all of their rehab patients. WE WILL build the pool!!! Last Wednesday, UGA Miracle unveiled our 2018-2019 fundraising goal: the number our organization has been striving to hit for the past 10 months and the number we hope to raise at Dance Marathon total reveal in 32 days. Setting a number goal brings a different sense of purpose and excitement when it comes to fundraising, a goal in which you and your organization must conquer together. Some of you may be asking, What is a fundraising goal? A fundraising goal is the number that we as an organization, UGA Miracle, hope to fundraise by 10 a.m. Sunday, Feb. 23rd. It is the number we hope to raise high above our heads at total reveal and go on celebrating for the rest of the year. A combination of every single one of our members’ efforts, perseverance and dedication. A uniting anthem for our entire organization to rally around. This year, our goal stands for all that We Will do for our hospital, miracle kids and campus. $1 million towards Children’s healthcare of Atlanta’s rehabilitation unit and $300,000 to Aflac Cancer and Blood Disorders Center. Accomplishing this goal will take our entire organization giving our all, this goal takes all of us. $1.3 M for the kids is attainable and possible, but only if we all work together and give it everything we have for these next 32 days. When fundraising over the next few weeks leading up to Dance Marathon, remember your why. Why do you support UGA Miracle? Why do you attend meetings every Wednesday when you could be at dinner with friends? Why did you join UGA Miracle? Your “why” is still the most powerful reason of all to keep fundraising, to keep striving to defeat your own fundraising goal and keep dedicating yourself to this organization. All we do is for our hospital and our miracle families, so it is for them that We Will raise 1.3 million dollars. Dance Marathon is in 32 days. In just a few short weeks, we will be holding our number up high at total reveal and celebrating it for all it means to us, our hospital and our miracle families. In these next 32 days, hold your “why” close and join us in fighting for 1.3 million for the kids. Finals are over, students are home, now it’s time to get that dough ftk! This winter break, UGA Miracle is decking the halls of Children’s Healthcare of Atlanta by fundraising for our favorite kiddos and hospital. This winter break, instead of just posting on social media or sending some emails, try to organically fundraise ftk! Organic fundraising is a fun and easy way to earn money for your donor drive by doing tasks in exchange for donations, doing your own fundraising push and incentives or even asking for donations instead of gifts for a holiday or birthday. So, this winter break, think of some fun ideas, chores, tasks, etc. that you can do around your home or community to earn some extra cash for the kids of Children’s. Need some ideas? We’re got them! Babysit: Offer to babysit your nieces/nephews, next-door-neighbor’s kids or put an ad out on a local babysitting website and offer to babysit in exchange for donations! Petsit: What’s better than looking after a sweet doggo or kitten in exchange for an FTK donation? Nothing! Wrap holiday gifts: Wrap your family’s, friends’ or neighbor’s holiday gifts for them in exchange for donor drive $$. Host a holiday party: Invite your friends and family over to watch Christmas movies, exchange gifts, eat dinner and more and set out a can to collect donations from any willing guests. Bake sale: Bake and sell some holiday goodies and donate your proceeds to your donor drive! Ask for donations instead of holiday gifts: Instead of asking for a physical gift this holiday, ask for a donation towards your donor drive instead! Caroling: Grab some friends, bundle up and sing some holiday songs for donations! Run errands: Offer to run errands for the busy busy neighbor, family member or friend in your life who really needs a break. Pick up/Throw-away Christmas trees: After the Christmas holiday, start a pick-up service to pick-up and throw-away Christmas trees. Sell your clothes: Sell you unwanted clothes to friends or a consignment shop and donate your profits. Dog Walking: Walk some sweet furry friends and receive a donation FTK! Driver: Drive your family and friends around to their holiday parties and act as their own personal UBER in exchange for a couple dollars towards your donor drive! Create a holiday fundraising incentive: Select a fundraising goal for yourself (Your committees are each trying to raise money for a specific piece of equipment for the hospital…how much would you need to raise to make that happen? ), and then come up with a fun incentive! Jump in a freezing cold lake, walk around the mall in a Santa costume, bake all your donors cookies, so many fun opportunities! Go canning: Set out a can at your place of work, walk around the mall, the possibilities are endless! Grab some friends and a can and go canning to ask for little donations towards the kids. Arts and Crafts: Get creative and make some crafts as stocking stuffers or ornaments and sell them FTK! Sell your products: Are you incredible at drawing? Painting coolers? Or great at building things? Use the winter break downtime and sell your products then donate the proceeds to your donor drive. There you are! Some quick and easy tips to organically fundraise this winter break. We Will Deck the Halls of Children’s and We Will keep fundraising FTK! Today is UGA Miracle’s first big fundraising push: ZERO ZEROES DAY! What this means is that we want everyone’s donor drives to have some sort of number in it, whether that means you have $1 or $500. This officially begins fundraising for the year, and gets everyone into the groove of fundraising and asking people for money. Going about Zero Zeroes day is easy. All you have to do is raise at least $1! Personalize your donor drive, so that donors are more willing to donate because they’ll see your heart and passion for our organization. The next step might take some getting out of your comfort zone, but you have to start somewhere: start asking for donations. Make a facebook post, post an instagram or on your instastory, make a snapchat stories, text a relative or family friend, etc. Explain what this day means, and why we are doing it, and what a donation to your donor drive would mean to you! Asking people always feel awkward, but people are willing to donate to a cause if you make the effort! So GET PUMPED for the first big fundraising push and lets have ZERO zeroes on our donor drive! On August 28th, UGA Miracle’s Kickoff marked the official start to miracle’s 24th year. The doors to Tate Grand hall opened at 6 p.m. and people flooded in. The room was filled within minutes of eager freshmen and excited returners ready to begin their miracle year. 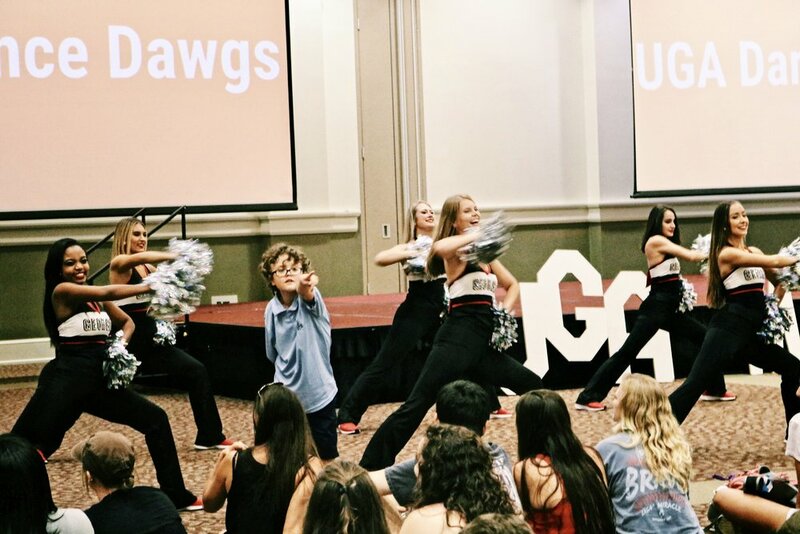 An energetic performance by our very own dance dogs hyped up the crowd with UGA football chants and our executive board then introduced themselves with a quick introduction about what their committee does for miracle. The Grelecki family stole the show when they got on stage and told their story of what miracle has meant to them for almost 10 years. Their son, Parker, was being his normal self running around, hyping up the crowd while his dad was captivating the crowd with their story. Parker was treated at Children's Healthcare of Atlanta when he was born, suffering from Hydrocephalus, a condition in which 98% of his skull was filled with fluid and only 2% was brain matter. Mr. Grelecki explained that while Parker is a happy, healthy and energetic young 9-year-old boy today, his condition was life-threatening and extremely dangerous, Parker would not be alive without the dedication of Children’s doctors and nurses. Mr. Grelecki went on to say that UGA Miracle has played a pivotaol role in Parker’s childhood and has had an incredible and lasting impact on their family. While Parker is currently healthy, his condition at birth has made it so that he develops at a different rate than children his own age. To other nine year olds, Parker is different. However, because of UGA Miracle, Parker doesn’t feel “different” he feels special. Every year, he gets to interact with college students who think he is the coolest guy in the room, who adore him and laugh at every single one of his crazy antics. UGA Miracle’s impact on Parker and their family will last for a lifetime. Mr. Grelecki went on to encourage every individual sitting in Tate Grand Hall to get involved, and stay involved, because not only is UGA Miracle raising money for an incredible hospital, but UGA Miracle literally saves lives. Our theme for this year will not be a number goal, but instead “WE WILL,” as in we will do everything in our power to make this the best year possible for the families and for our school. This year is not about a fundraising number, but it is about the difference we want to make in the lives of our families, our campus and our hospital. WE WILL.